Description This chapter describes the dermoscopyThe examination of [skin lesions] with a 'dermatoscope'. This traditionally consists of a magnifier (typically x10), a non-polarised light source, a transparent plate and a liquid medium between the instrument and the skin, and allows inspection of skin lesions unobstructed by skin surface reflections. Modern dermatoscopes dispense with the use of liquid medium and instead use polarised light to cancel out skin surface reflections. of acquired nonscarring alopeciaThis glossary term has not yet been described. Trichoscopy, Nonscarring alopecia, Dermoscopy Aqcuired nonscarring alopecia – cite! Aqcuired nonscarring alopecia (message) Aqcuired nonscarring alopecia – participate! Androgenetic alopeciaThis glossary term has not yet been described. Fulfillment of two major criteria or one major and two minor criteria is required to diagnose female androgenetic alopecia. Template:Trichoscopy of androgenetic alopecia with hair shafts thickness heterogeneity, yellow dots and predominance of single-hair units. Alopecia areataThis glossary term has not yet been described. Trichoscopic findings of alopecia areataThis glossary term has not yet been described. include black dotsDots are small, round structures of less than 0.1 mm in diameter that have a red color when corresponding to blood vessels; however, when due to melanin, their color ranges from black, brown, to blue-gray depending on the depth and concentration of the melanin in the skin (Tyndall effect)., broken hairs, exclamation mark hairs, tapered hairs, Pohl-Pinkus constrictions, yellow dots, short vellus hairs, upright regrowing hairs and pigtail hairs . Active hair loss in alopecia areata is characterized by presence of black dots, broken hairs, exclamation mark hairs, tapered hairs and Pohl-Pinkus constrictions [6, 7]   . In long-lasting, non-active disease mainly yellow dots and short vellus hairs are observed . Good response to the therapy of alopecia areata is characterized the reduction followed by the loss of exclamation mark hairs, broken hairs and black dots . Yellow dots are the least responsive . 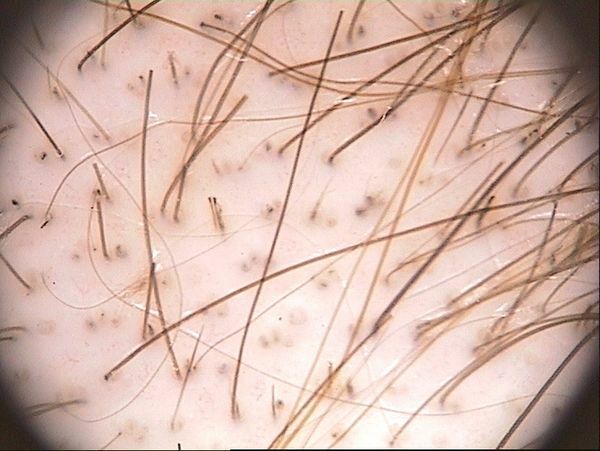 In initial hair regrowth, increased number of short vellus hairs is observed. With the continuation of the therapy they are substituted by fully pigmented terminal hairs so a decreased number of short vellus hairs may be detected . Hair regrowth is characterized by presence of upright regrowing hairs and pigtail hairs . 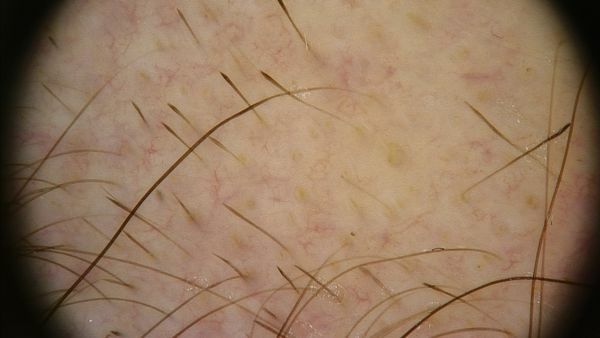 Template:Trichoscopy of alopecia areata with presence of exclamation mark hairs. Template:Black dots, yellow dots and broken hairs in patient with alopecia areata. Template:Multiple yellow dots in patient with inactive alopecia areata. TrichotillomaniaThis glossary term has not yet been described. TrichoscopyThis glossary term has not yet been described. of trichotillomaniaThis glossary term has not yet been described. is characterized by presence of hairs broken at different length, black dots, trichoptilosis, coiled hairs, flame hairs, V-sign and tulip hairs . 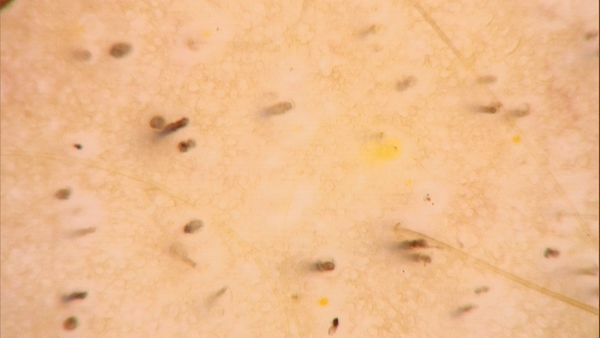 Moreover exclamation mark hairs, yellow dots and upright regrowing hairs may be observed . Other characteristic, but rarely described trichoscopic findings include hair powder and follicular microhemorrhages [13, 14]. 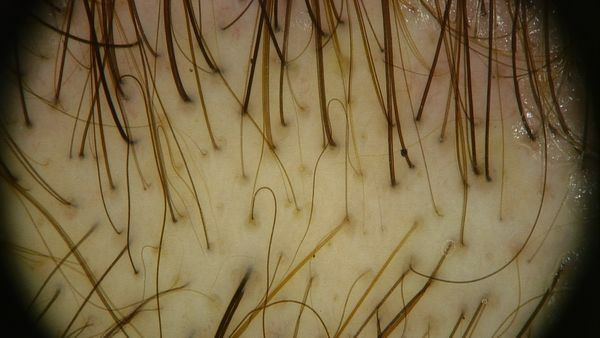 Template:Trichoscopy of trichotillomania with presence of hairs broken at different length, black dots, and tulip hairs. 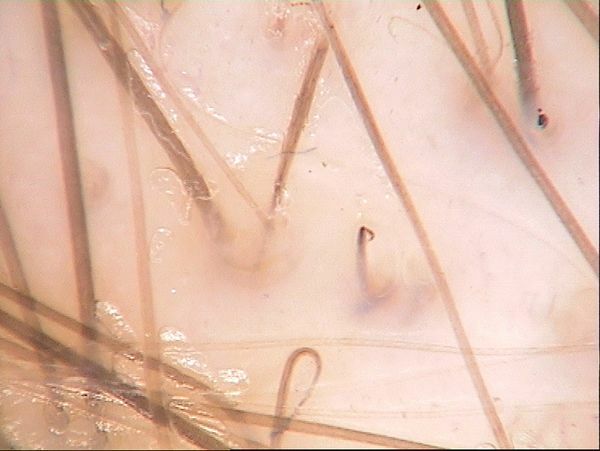 Template:Coiled hairs in patient with trichotillomania. 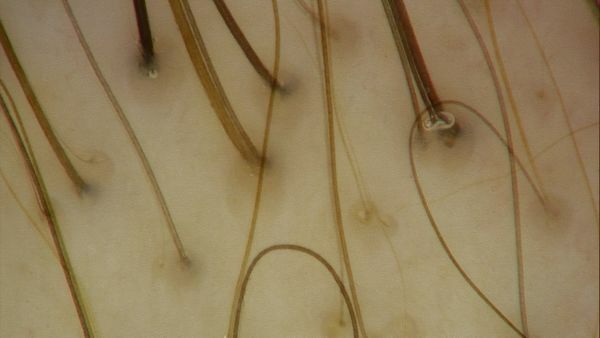 Template:Tulip hairs in patient with trichotillomania. Telogen effluviumThis glossary term has not yet been described. There are no specific trichoscopy findings of telogen effluviumThis glossary term has not yet been described. . However, presence of upright regrowing hairs and predominance of single-hair follicular units with perifollicular discoloration may be indicative of telogen effluvium in absence of features characteristic for other causes of hair loss . 1. 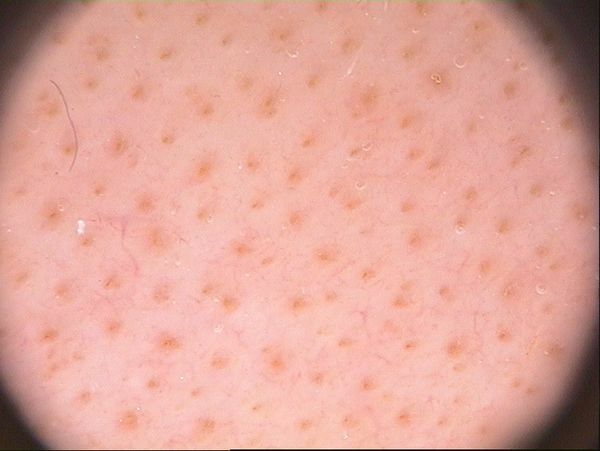 Rakowska, A., et al., DermoscopyThe examination of [skin lesions] with a 'dermatoscope'. This traditionally consists of a magnifier (typically x10), a non-polarised light source, a transparent plate and a liquid medium between the instrument and the skin, and allows inspection of skin lesions unobstructed by skin surface reflections. Modern dermatoscopes dispense with the use of liquid medium and instead use polarised light to cancel out skin surface reflections. in female androgenic alopecia: method standardization and diagnostic criteria. Int J Trichology, 2009. 1(2): p. 123-30. 2. Deloche, C., et al., Histological features of peripilar signs associated with androgenetic alopecia. Arch Dermatol Res, 2004. 295(10): p. 422-8. 3. Blume-Peytavi, U., et al., S1 guideline for diagnostic evaluation in androgenetic alopecia in men, women and adolescents. Br J Dermatol, 2011. 164(1): p. 5-15. 4. Rudnicka, L., et al., Trichoscopy update 2011. J Dermatol Case Rep, 2011. 5(4): p. 82-8. 5. Waskiel, A., et al., Trichoscopy of alopecia areata: An update. J Dermatol, 2018. 6. Guttikonda, A.S., et al., Evaluation of Clinical Significance of Dermoscopy in Alopecia Areata. Indian J Dermatol, 2016. 61(6): p. 628-633. 7. Inui, S., et al., Clinical significance of dermoscopy in alopecia areata: analysis of 300 cases. Int J Dermatol, 2008. 47(7): p. 688-93. 8. Kibar, M., et al., Trichoscopic findings in alopecia areata and their relation to disease activity, severity and clinical subtype in Turkish patients. Australas J Dermatol, 2015. 56(1): p. e1-6. 9. Inui, S., T. Nakajima, and S. Itami, Coudability hairs: a revisited sign of alopecia areata assessed by trichoscopy. Clin Exp Dermatol, 2010. 35(4): p. 361-5. 10. Rudnicka, L., M. Olszewska, and A. Rakowska, Atlas of trichoscopy: dermoscopy in hair and scalpThis glossary term has not yet been described. disease. 2012, London: Springer. 11. Ganjoo, S. and D.M. Thappa, Dermoscopic evaluation of therapeutic response to an intralesional corticosteroid in the treatment of alopecia areata. Indian J Dermatol Venereol Leprol, 2013. 79(3): p. 408-17. 12. El Taieb, M.A., et al., Platelets rich plasma versus minoxidil 5% in treatment of alopecia areata: A trichoscopic evaluation. Dermatol Ther, 2017. 30(1). 13. 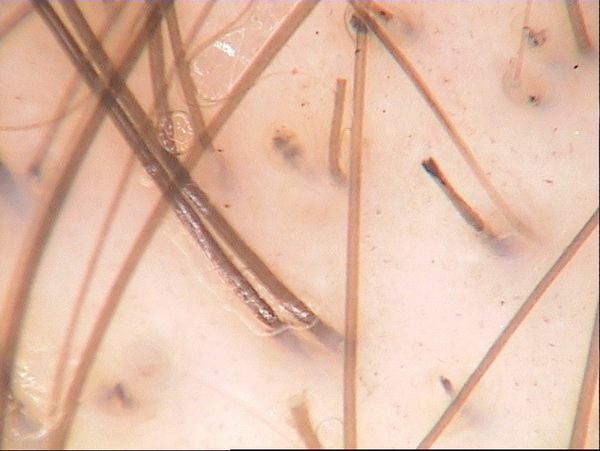 Rakowska, A., et al., New trichoscopy findings in trichotillomania: flame hairs, V-sign, hook hairs, hair powder, tulip hairs. Acta Derm Venereol, 2014. 94(3): p. 303-6. 14. Kowalska-Oledzka, E., et al., 'Black dots' seen under trichoscopy are not specific for alopecia areata. Clin Exp Dermatol, 2012. 37(6): p. 615-9. This page was last modified on 29 March 2019, at 14:18.